1967-68 Camaro Bumble Bee Paint Stencil Kit. Eash kit consist of two left & right header panels, two upper and two lower left & right fender stencils. Left & Right header panels stencils. Left & Right two upper and two lower fender stencils. Color photos of original cars. 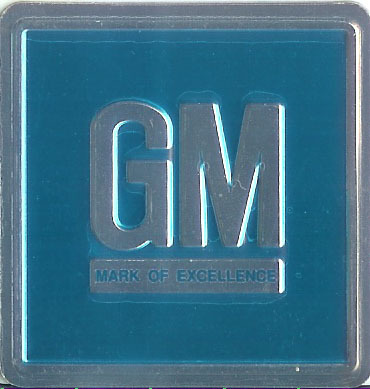 NOTE: This kit was reproduced from the original GM stencil kit and released by us in 1985. Featuring all alignment notches originally used by GM in their stencil including the part number. All stencils are precut for specific body panels (not something that has to be cut from a sheet). Chevrolet first released this stripe in 1967 and continued it into early 1968 before replacing it with the the D90 wrap around stripe that turned under the emblem engine and continued past the front tire ending on the rear section of the door. We do not offer this kit in a vinyl format due to the compound curves in the front fender area which would require multiple sections and overlapping of the stripes. Did you know GM Paint Stencil Kits normally were partial stencil kits with no measurements included?We are the originator of complete stencil kits with both instructions and color photos of original car stripes, when possible. Even the part number is used when possible. Did you know that GM painted the “doghouse” assembly (front fenders, hood, etc.) 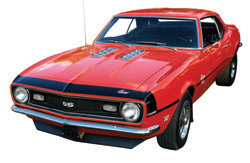 separately from the rest of the body on the assembly line, and mounted it onto the body after it was painted?That is why the FRONT portion of the fender and header panel stripes are painted, and the REAR portion of the front fender stripes and door stripes are vinyl on ’68-’69 Camaros. #1051250 1968-72 Brushed Aluminum plate with blue background inside door opening. Great addition to any car car. 1050808 1967 Brushed Aluminum plate with Teal background. Great addition to any car.